I’ve always said that cheese is edible art. As an art student, I would trawl the city’s myriad galleries and inevitably stumble upon shows that consisted of nothing more than a pile of crumpled up newspapers, or a single crouton on a pedestal in the middle of the room, or worse: an empty gallery that was supposed to mean something. So I got out of the art world and found cheese. Finally! It was an edible art form that any normal person could ‘get’. No instruction manual required… just tastebuds and a willingness to try. This Saturday at the Essex Market, we’ve got the absolute best of both worlds! Saxelby Cheesemongers is proud to announce ‘The Milk is the Medium’, an art show celebrating the paintings and cheese of Blue Ledge Farm. Greg Bernhardt and Hannah Sessions are the tour de force behind Blue Ledge. The pair met while studying art in Italy, hatched a plan to return stateside and make cheese, and never looked back! Their art reflects their daily lives on the farm, and ruminates on the many connections between art and agriculture. Come by the market this Saturday to meet Hannah and Greg, view their farm and cheese-inspired artworks, and feast on their delicious goat cheese. For more information and a proper press release, visit Cuchifritos, Essex Market’s own art gallery! Now it’s starting to be that time… That holiday-induced, brow-furrowing, ‘what the heck am I going to get for so-and-so this year? !’ kind of time. Well if that special so-and-so happens to like cheese, we’ve got a few tricks up our sleeve that could be just what you’ve been searching for. 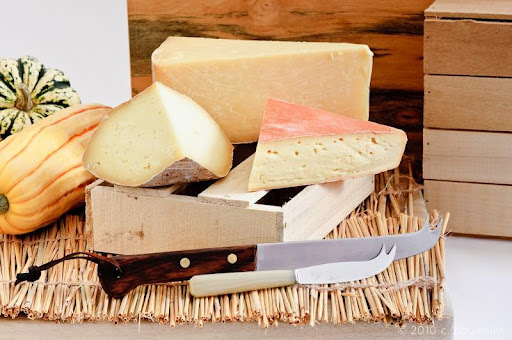 This week only, order a Holiday Cheesemongers’ Choice selection from Saxelby Cheesemongers and save 15%! Just enter the coupon code ‘Holiday’ and we’ll take care of the rest. Saxelby’s Small Holiday Cheesemongers’ Choice selection features three hearty half-pound wedges of our favorite fromage: Cabot Clothbound Cheddar, a nutty, grassy, butterscotchy cheese matured in the Cellars at Jasper Hill Farm, Grayson, a gooey, pungent, beefy stinker of a cheese from Meadow Creek Dairy, and Ben Nevis, a delicious, oddly-shaped, sheeps’ milk cheese from Bonnieview Farm reminiscent of nutty Italian pecorino. For the serious cheese hound in your life, we’ve got the Large Holiday Cheesemongers’ Choice. Your lucky cheese lover will receive five luscious, butterfatty hunks of farmstead cheese: Cabot Clothbound Cheddar, Grayson, and Ben Nevis as mentioned above, plus Bayley Hazen Blue, a rich and fudgy blue from Jasper Hill Farm, and Sozzled Pearl, a button of cow & goats’ milk cheese wrapped in Bourbon-soaked grape leaves from Seal Cove Farm. 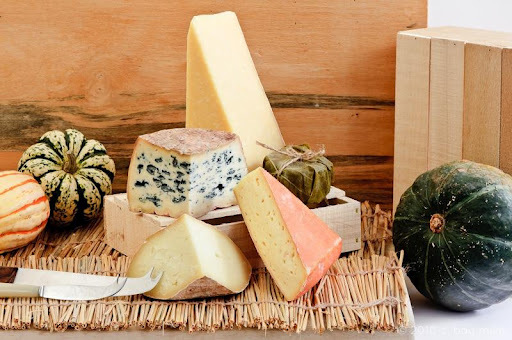 Place your order online at saxelbycheese.com. Be sure to tell us when you’d like your package to be shipped! Just make a note in the comments field when checking out (you can write gift notes there too!) Please note that the last day to ship for delivery by Christmas is Tuesday, December 21st. The last day to ship for delivery by New Years is Tuesday, December 28th. In our neverending quest to be cheesy, we’ve recorded a new episode of ‘Cutting the Curd’ for your listening & leisure! Our ‘State of Cheese’ series takes us to Louisiana for a conversation with Richard Sutton, owner of the St. James Cheese Company. Learn about creole cream cheese, where Queen Elizabeth buys her cheese, and why the French didn’t necessarily import their cheese traditions to the bayou. ‘Till next week, eat cheese, stay warm, and be merry!